Christmas has come, the visiting family has gone and things are beginning to get back to normal – as normal as things ever get with my dysfunctionally-charming familial group. 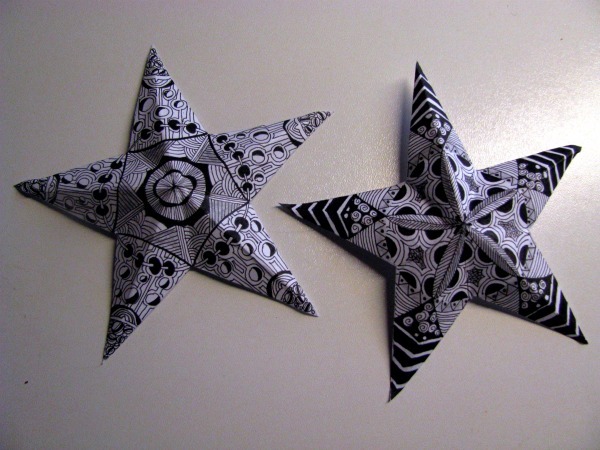 It’s almost time to start packing away the Christmas decorations which includes my Zentangle Christmas Stars. Who knew something as simple as a paper star would hit such a chord with so many people from all over the world! I heard from Zentangle artists in South Africa, Canada, Australia, the Netherlands, Columbia and those are just the countries I can think of off the top of my head. Your warm response and how you were making the stars a part of your holiday celebration made this Christmas a special one for me. I had 6,600 hits on my blog in one day from people looking for the star tutorial! So at this time I would like to share the picture of the amazing stars made by Annemarie Huijtz from the Netherlands. She wrote me a darling email where she pointed out one of the most alluring features of Zentangle, that individually we can work on the same project but have such amazingly different results! So true!